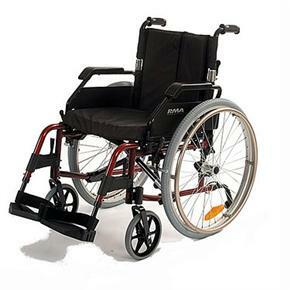 The RMA 1500 is a lightweight, modern self-propelled wheelchair is available with a red or blue frame. The footrests swing either inward or outward, and the chair is fully equipped with quick-release anti-tips, an adjustable backrest, and nice comfortable padding. Elevating leg rests are available and so are puncture-proof tyres. Flip-up arm rests come as standard and the attractive red or blue wheelchair frame has a triple coat of paint to make sure it stays looking good after prolonged use. Quick release rear wheels 24"